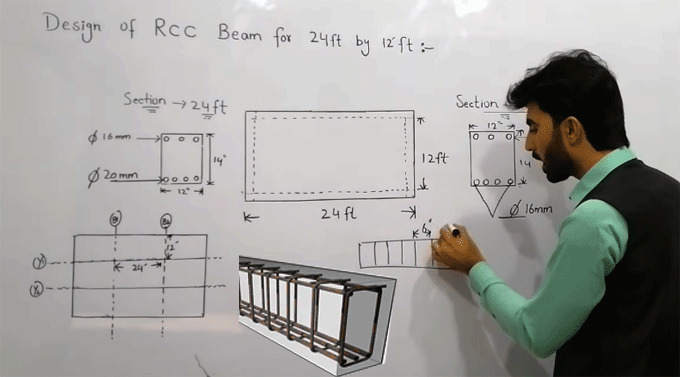 In this exclusive construction video tutorial, you will be familiar with step-by-step methods necessary for creating design of beam with dimension 24 feet by 12 feet. Assume the width of the beam as 12 inches and depth of the beam as 14 inches. At the bottom of the beam, there are four numbers of steel bars with diameter 20 mm. At top of the beam, there are three numbers of steel bars with diameter 16 mm. This formula is applicable to design the beam with dimension 16 feet to 30 feet. Assume the width of the beam as 12 inches and depth of the beam as 14 inches. At the bottom of the beam, there are four numbers of steel bars with diameter 16 mm. At the top of the beam, there are three numbers of steel bars with diameter 12 mm. Here, the spacing for diameter of stirrup is 6 inches and the diameter is 8 mm.